Great strides were taken in the field of architecture. The royal tombs of the first two dynasties were large structures with the tomb chamber and surrounding rooms hewn deep in the bedrock surmounted by a superstructure of the characteristic ‘palace-fagade’ panelling. The Egyptian tombs of the noblemen were strong, low brick structures with rectangular ground-plan and sloping walls for which the word ‘mastaba’ (bench) was coined by workmen excavating under the French Egyptologist Mariette. In the 3rd dynasty Zoser’s architect, Imhotep, drew up plans for his majestic funerary complex, the central feature of which was the Egyptian Step Pyramid the first stone structure in history; Imhotep chose a rectangular site on the Memphite necropolis and marked the corners with stele bearing the names of Zoser and his two daughters. He erected a 30ft high wall round the chosen site using the palace-fagade panelling of the earlier dynasties. Imhotep then commenced excavation of the substructure and lined the floor of the tomb chamber with granite brought by river from the quarries of Aswan. A series of chambers and a maze of corridors to house the furniture and effects of the deceased were lined with blue tiles. The superstructure was at first a simple mastaba with a unique square ground-plan. However, a second facing of limestone was then added, 2-3ft lower than the original wall, thus forming a step. An extension to the east rendered the mastaba rectangular. A series of pits led to a 90ft gallery on the east of the mastaba and it may have been to incorporate these into the tomb that the idea of constructing a second tier first dawned on Imhotep. The ancient Egyptians were still inexperienced in the use of stone, and Imhotep was not an architect with a blueprint so much as an imaginative builder. It was when constructing the third tier that he included in the overall design a mortuary temple and a whole series of dummy buildings. When the fourth tier was raised, the construction could finally be called a Step Pyramid of Zoser king. The last two tiers were added by enlarging slightly on either side. The six-step pyramid was encased in a final layer of fine limestone and rose majestically above the surrounding wall. It was approached through a gateway in the girdle wall, leading to a colonnaded hall which gave on to a Great Court. 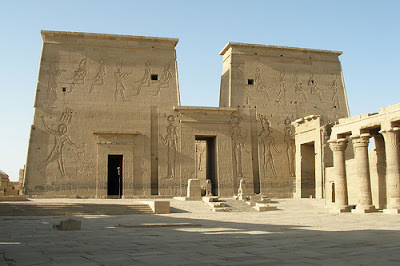 The enormous architectural significance of Zoser’s mortuary complex lies in the fact that Imhotep drew inspiration from the contemporary houses and palaces which have all perished. He transcribed into masonry all light, perishable materials and though his were the first large-scale experiments in stone, he nevertheless provides us with simple elegance and mature expression which is characteristic of the Egyptian Old Kingdom. Less than a century lies between the construction of Zoser’s Step Pyramid at Sakkara and that of the Great Pyramid of Khufu at Giza. The mastery of stone is reflected, however, in several stages of development. Zoser’s successor, Sekhemkhet, also had a Step Pyramid (i). Khaba had what is now known as the Layer Pyramid (2), at Zawiyet el Aryan between Giza and Abu Sir. Nebka’s ‘Unfinished Pyramid’, in the same area, is believed to have been planned on the same lines as Zoser’s. A change came with Huni, the last pharaoh of the 3rd dynasty. His pyramid at Meidum (3), though appearing somewhat like a tower today, was the first true pyramid. It was constructed in the form of an eight-step pyramidal monument at a steep angle of 51^° and, after the steps were filled in, the whole was carefully dressed in stone. The transition having been achieved, Senefru’s two pyramids at Dashur, known as the Bent Pyramid (4) and the Northern Pyramid (5), show a striving for an architectural ideal that was finally achieved with the perfect symmetry of the three Egyptian pyramids on the Giza plateau. There are no written or pictorial records of the methods used for the planning and construction of the pyramids. Clearly as much engineering know-how as brute force was necessary to raise them. Following such basic considerations as the choice of site on the western bank of the river, on bedrock free from defects, well above the Egyptian valley but in close proximity to the river for easy conveyance of stone was the task of levelling and smoothing the plateau to within a fraction of an inch and orientating the four cardinal points with a maximum error in alignment of little over one-twelfth of a degree. The building of the Egyptian great pyramids on the Giza, has been extensively written about. 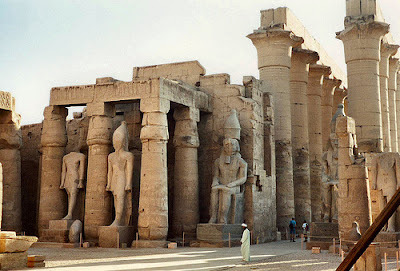 Some 2,400,000 blocks of sandstone were quarried from Tura on the eastern banks of the Nile, each weighing an average of 8 tons, they were transported to barges and sailed across the turbulent river in full flood. They were then lowered on to rollers and probably manoeuvred up an earth ramp to reach the plateau. Even stones weighing as much as 16 tons were brought into contact as close as one-five-thousandth of an inch. The pyramids are now stripped of their smooth outer casings of fine-quality, exquisitely fitted, polished limestone. The great pyramid of Khufu once rose to a height of 483 feet and its base covered 13 acres. It is difficult, even today, to visualise the strength of a state able to support such projects, let alone provide the skill and technical ability to raise them. A causeway once linked the mortuary temples of the Egyptian pyramids and the valley temples on the river’s edge. Khafre’s causeway was constructed of white limestone, its lower blocks let into the rock surface beneath. 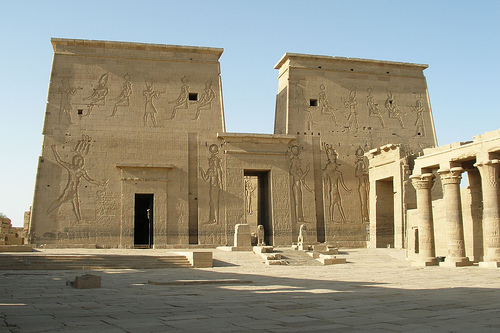 His valley temple was encased in granite from the quarries of Aswan. This was a final step in the mastery of stone: the finest-quality raw material with an emphasis on straight lines, both perpendiculars and horizontals. The ‘granite temple’ is an example of simple, massive elegance. The statues which decorated the interior were lit by the use of oblique slits forming roof windows between the level of the central aisle of the court and the lower roof on either side. The use of sunlight for illumination was an important feature of ancient Egyptian architecture.